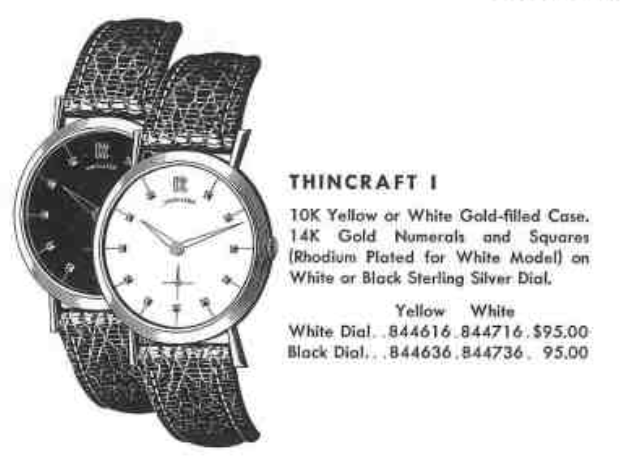 There are 142 "thin" watches when you include the myriad Thin-o-matics and Thinlines. The first arrived on scene in 1957 as the Thincraft I and Thincraft II. The Thincraft II was produced for four years but the Thincraft I was only around for two years - so it's a little harder to come by. The two models look very similar and the main difference is the movement inside. The Thincraft I used the 22 jewel 770 movement with a sub second hand while the Thincraft II used the 18 jewel 735 movement with a sweep second hand. Both models came with white or silver dials and white or yellow gold filled cases. 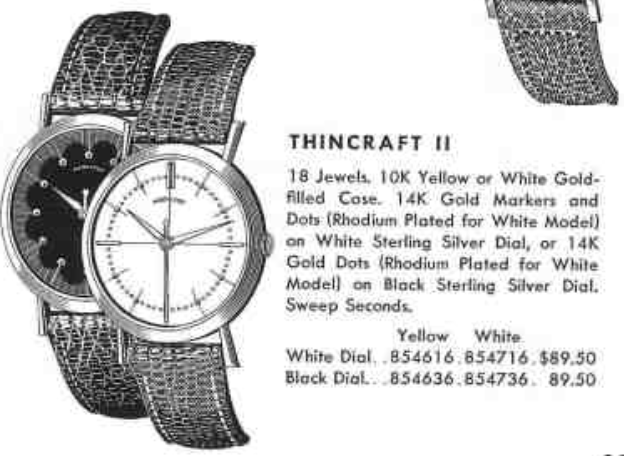 I think it's interesting that the Thincraft II had a different dial pattern for the white and black dials but the Thincraft I has the same pattern for each color dial. Both models have very long delicate lugs and I wouldn't be surprised if a lot of Thincraft examples have been lost to time by having a lug or two break off. I recently had a fellow collector send me his newly acquired Thincraft I example and it was a real beauty. I don't know how much wrist time this watch has seen in the last 60 years but it couldn't have been too much. The case back looks similar to a Thincraft II but it's a little flatter since the 770 movement doesn't require much depth. The inside of the case back has a recess to securely hold the 12/0 sized movement. This movement is very clean looking but that doesn't mean the oil inside hasn't evaporated and gummed up. So even a clean looking movement should be overhauled every few years. Once the balance jewels are secured under their shock spring the balance has a smooth motion. This is looking good so far. Well, there's not much to complain about this 60 year old Hamilton movement. I can't say the watch looks too much better than what I started with but I can say that it's now ready for some worry-free wrist time.